The wonderful, peculiar and epic rock band Gallow's Pole from Austria is back with another delicate album and it seems like they have decided to go "all in" this time, because this is their fourth full-length album since 2008! If I tell you the bands discography you will understand why I'm quite surprised by this release. Their band-history goes back to the beginning of the 80's. They did release their debut album 'In Rock We trust' in 1981 and the next full-length album 'We Wanna Come Home' took until 1989. Ten long years went until the third album 'The Smile of the Dolphins' (1999) was ready to the stores. In 2008 did they release the forth disc named 'IV' and in 2010 'Revolution'. Their previous album 'Waiting for the Mothership' I reviewed in 2011 and it was with that album I discovered this unique and pretty special band. The vocalist Alois Binder has a very epic and personal vocal tone and is perfect to Gallow's Pole's music. There aren't any sweet pop-radio friendly songs that you can chew and swallow at the same time. No, my friends. 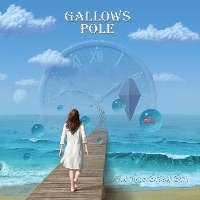 Gallow's Pole is offering a musical dinner, which demands full concentration and focus. Very mature hard rock marined with melancholic spices and slowly steam-cooked in a thick juicy production. This is not an album that has been made with one leg in the air. Slow heavy hard rock with an ultra groovy sound. The guitars are put in the background on some of the tracks, which is quite odd and different from the rock, I usually listen to. I find it quite liberating and exiciting that they have their own sound and stick to it. No flirting with the mainstream or aiming for the hit lists. No, this is a pure work of art. If you appreciate their prevoius works, I promise that you will find this album worth having in your collection.